Compose sprite using layers & frames as separated concepts. Create RGBA, Indexed (256 colors), or Grayscale images. Open/save GIF animations, sequence of PNG files, ICO files, etc. Animation tools: Timeline, real-time animation preview, onion skinning. Draw patterns and textures with the tiled mode. Multiple editors/views for the same sprite. 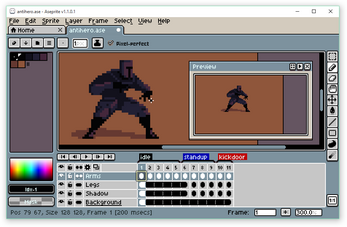 Pixel art specific tools: pixel perfect traces, filled contour & polygon, RotSprite rotation. More information in www.aseprite.org and in the release notes.